I would have preferred to watch Albany's Wellington Hotel go up than come down, but its demolition last Saturday was a pretty remarkable event in itself. Apparently, the demolition company threw in some fireworks for entertainment. The video shows the demolition from two different vantage points. You can read more about the demolition and the future Albany Convention Center here. Proposal by Cathryn Dwyre and Hudson Development Corp. The proposal to revamp the Seventh Street Park has produced a predictable polarization in Hudson. On one side are those desiring a full, historically accurate restoration and on the other are the supporters of a more contemporary design—either the current proposal or some other. Responsibility for this polarization lies at the feet of both camps. The contemporists have not done enough homework or engaged the design process publicly enough to justify the sweeping changes put forth by designer Cathryn Dwyre. And many preservationists have insisted on a full and literal restoration of the original park plan without considering the possibility that there might be a better way. I will focus in this post on one particular set of flaws in the original park layout; in the coming weeks I hope to explore other issues related to the past, current, and future design of the park. View of original Seventh Street Park looking northeast. a fountain located symmetrically at their intersection. 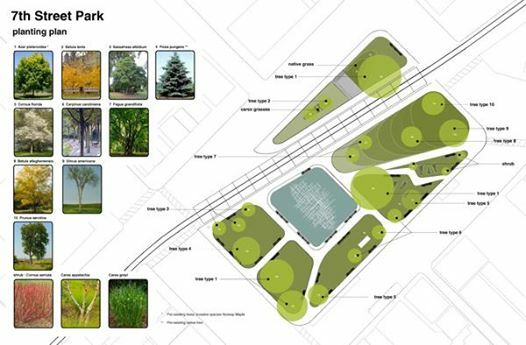 At her recent public presentation, Ms. Dwyre described the original layout of the park as a "default" nineteenth century solution. While perhaps taken by preservationists as a backhanded slap, her statement is not inaccurate. 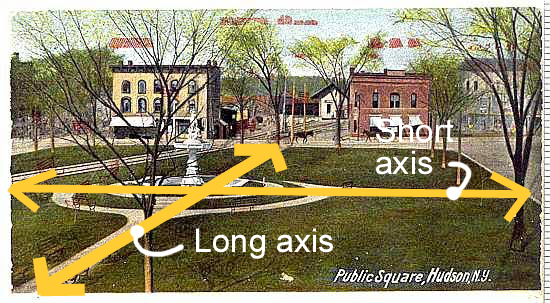 The park's configuration of two orthogonal pathways with a fountain at their intersection has been used many times. It is not unpleasant, and has worked elsewhere. But it does appear it was employed here without consideration of local conditions. A brief analysis of the park's pathways suggests the design falls well short of deserving an ironclad endorsement from Hudson's preservationists. Park pathways, properly understood, are continuations of larger systems of pedestrian movement. This is in large part because parks are activated as much or more by incidental or casual users as by deliberate users. In other words, a park's designer has a primary responsibility to encourage use by those who encounter it by chance as well as by those who make a conscious decision to go there. When incidental users are successfully engaged, a baseline of activity is assured, making the park safer and more enjoyable for all. The historical park plan (above left) ignores these realities of human behavior and urban context. The entrance points are located at mid-block rather than at the corners, and the pathways run orthogonally rather than diagonally. The best-case outcome of this is undesirable wear patterns in the grass; the worst case is that pedestrians dangerously cross streets at mid-block when approaching and leaving the park. Somewhere in the middle of the best-worst scale, perhaps, is that the park simply isn't as good and inspiring a place as it could be. The existing pathway that runs across the short dimension of the park does allow for some degree of natural pedestrian access, as it is an extension of Prison Alley. But this advertises a different problem: the Venus fountain lies on axis with a back alley instead of with a major street or important building. Those interested in the more essential values and goals of traditional city planning, and who do not insist on preservation for preservation's sake, would recognize this as a nineteenth century faux pas. larger, natural patterns of pedestrian movement in the neighborhood. Of course, many in the preservation camp will poo-poo any proposed changes simply because they aren't "historic." This amounts to an argument that history is right simply because it got there first. Such history-centric individuals belong in the same category of non-thinkers as those who deem something of value simply because it's new and different. (Designers of the PARC Foundation Park in Hudson, take note.) A thinking person—someone open to the best of the past, present, and future—knows that history has gotten things right and wrong—not only in the usually cited arenas of politics, war, and civil rights, but also in architecture and city planning. I have more pressing, and more urban, issues to attend to, but I figured I'd post these oddball cars I came across a couple weeks ago until I can organize those more complex thoughts. I have to travel to Kingston to get my car serviced, and in that part of the Hudson Valley I always see unusual vehicles. This time, while heading south on 9W, I spotted this frog-eyed, c.1973 Volkswagen Super Beetle. Someone had painstakingly replaced the standard headlights and taillights with square units. Warping the fenders to the new light shapes called for some real metalworking skill. The maniac highly skilled craftsperson also replaced the stock rear window with an oval window from a mid-1950s Beetle. I don't admire the aesthetic result, but I do admire the patience and technical ability it takes to achieve such seamlessness. As I pulled away from the Beetle, another oddball sped by. It was one I had seen several weeks earlier near Palenville. At that time, it was traveling in the opposite direction on a two-lane road; by the time I noticed it, the "Gray Ghost" was over my shoulder. The taillights receding in my rear view mirror looked vaguely familiar, but I was stumped. It seemed somewhat Studebaker-ish, but I also thought it could be a rare 1960s European coupe. This time I caught up to the Gray Ghost near the Hudson Valley Mall. 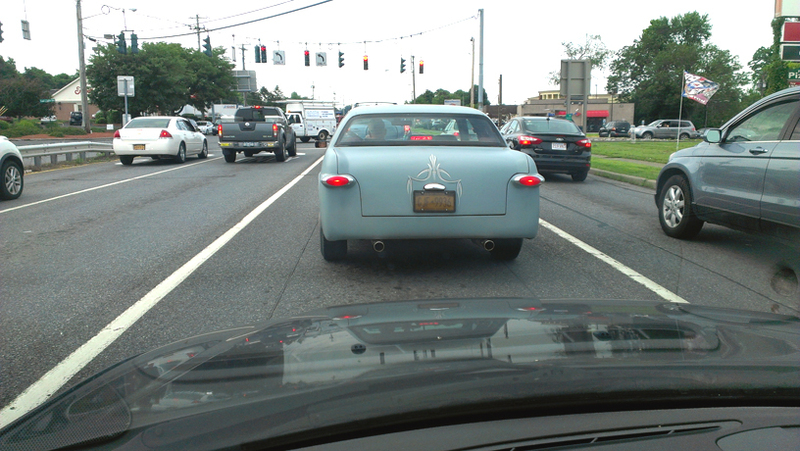 The taillights again looked familiar, but the car's overall shape did not. From the side (below), I could tell the greenhouse was from a 1990s Mercury Cougar. (Such minutia resides in the same general area of my gray matter as Joe Torre's .363 batting average in 1971. I am not proud of this.) The rest of the car remained a mystery. The mystery car, left, shares a center section (door, wheel arches, and greenhouse) with a 1993 Mercury Cougar. The front was a cartoon version of something 1950-ish. I'd have to count on the taillights, with their unique lozenge shape and tapering trail into the fender, to help me identify the donor car once I could poke around. The interwebz came through again: the DNA donor was a 1949 Ford, seen below. As with the VW, the technical skill involved is remarkable, as the two cars that were merged are of very different dimensions and were built more than forty years apart. The lesson here is clear: if one is going to write a blog post that castigates his fellow urbanists for running around the region attending to life management, he shouldn't follow it up with a post on his running around the region attending to life management. We now return to our regularly scheduled urbanism. Yesterday I found myself thinking about the second of the two words at the head of this blog. Should it have read "Hudson Urbanist" instead of "Hudson Urbanism?" That small change might have granted me the freedom to write here about what interests me on a given day—baseball, politics, life minutia, and so on—instead of fixating solely on the urban condition. I didn't settle that debate, but my musings got me thinking about the word "urban" and the extent to which America's urban problem—or is it our suburban problem?—is exacerbated by widespread misuse of it. Consider the U.S. Census Bureau's report that 81 percent of Americans live in urban areas. This piece of data (datum?) places the cul-de-sac-dwelling, automobile dependent suburbanite in the same category as the sidewalk pounding Brooklynite. I have to think this makes the fight against the environmental and social ravages of suburban sprawl ever more difficult and diffuse. Geographers, sociologists, historians, and others concerned with broad patterns of societal development make the same conflation: when they compare modern societies to ancient or tribal societies, they place a label of "urban" on those having water and sewer infrastructures, formal governments, advanced methods of goods production and distribution, and so on. They lump the suburb with the "urb." Further poking prompts more questions than answers: is "urban" a proper adjective for "city" even though many city districts are as suburban in their physical makeup as those outside the city boundary? Is it appropriate for a mayor to proclaim his city's "urban renaissance" as he cuts a ribbon for a new strip mall? Is it fair to blame the excessive consumption of land and resources on "urban sprawl" when by definition it is suburbs, not urbs, that sprawl? What should we make of Newton, Massachusetts, a suburb of Boston that is politically a city, that is physically predominated by single-family houses and strip malls, but that has within it thirteen quasi-urban villages? And what can we conclude of a person living in Boston's Back Bay—an urban neighborhood by probably everyone's definition—who drives thirty miles daily to a job in suburban Westborough? Is she an urbanite or a suburbanite? If she took a new job in downtown Worcester, would that change anything? Wouldn't she, despite structuring her life around two urban places, be living a life that is dynamically suburban? Such questions point to two things we need to do if we are to realize more sustainable, more local, and more urban ways of building and living. One, we need to define urban and suburban in a way that clearly and concisely differentiates their physical characters. 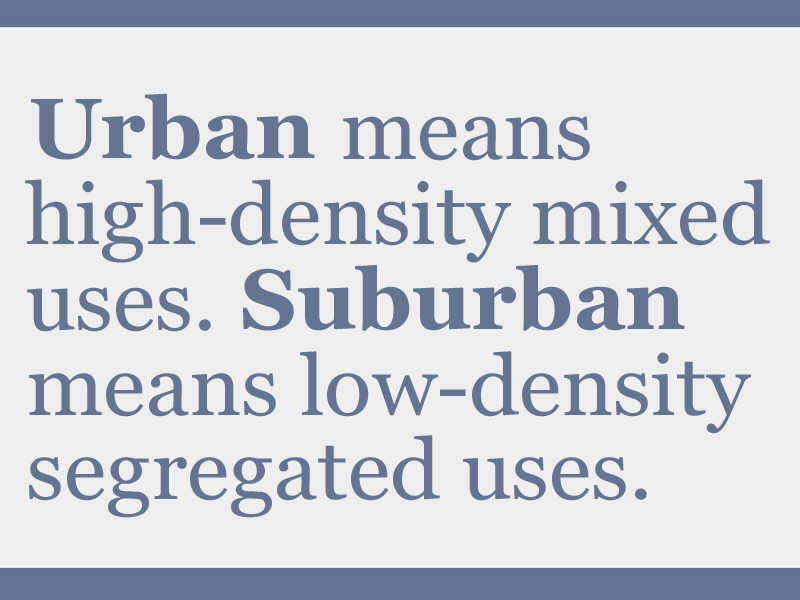 To this end I offer the following: Urbanism is high-density mixed uses, and suburbanism is low-density segregated uses. It doesn't matter if a settlement is within a city or not; its actual makeup is what counts in this categorization. There remains a finer grain to explore, but this distinction covers more ground more effectively than anything I have come across in thirty years of study. Two, we need to go beyond physical definitions and reinstill the dynamic realities that support urban places. As our Back Bay friend demonstrates, one can "live suburban" in an urban place. This largely negates the point of urbanism. Yet the distinction is often lost on the urban planning establishment, which easily defaults to accommodating a suburban social order within a physical facsimile of urbanism, rather than foster urbanism as a way of life. This will not do. It is not enough for citizens to establish residence in an urban place while chasing around the region to fill their life needs. Nor is it acceptable, as is so often the case, for residents of urban neighborhoods to insist that their neighborhoods not change—that they not grow denser or birth new businesses. It is not enough to preserve existing urban environments; one must support those policies, practices, and processes that foster greater density and more mixed uses, and thereby more local living. Because this is what urbanism is. Gossips of Rivertown reports today that the Town of Wolcott, New York has a Venus statue very similar, if not identical, to Hudson's long-stored and currently debated Venus. It sits in the center of town on a triangular traffic island, visible at the center of the photo below. Coincidentally, on Monday John Isaacs suggested that Hudson's Venus be re-sited on a similar (and slightly larger) triangular traffic island in Hudson. 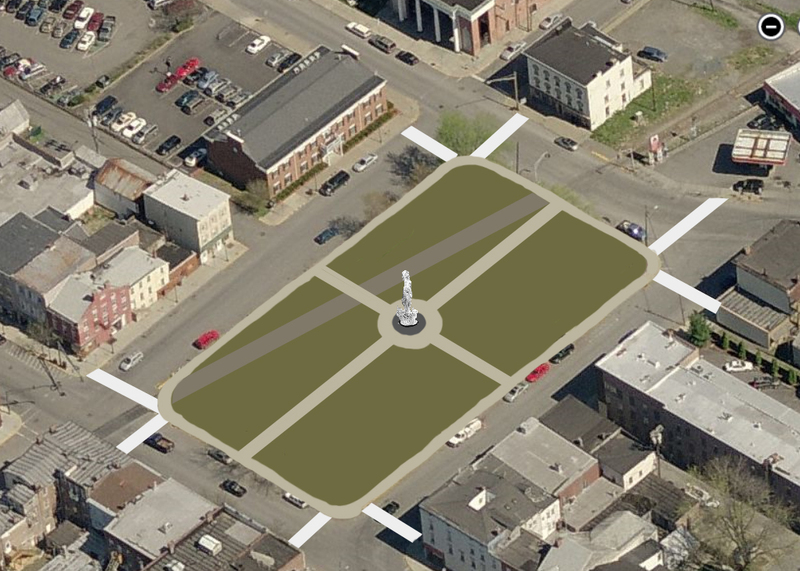 His suggestion was panned by Gossips' commenters, who were unwilling to consider anything other than its original placement in the center of the Seventh Street Park. 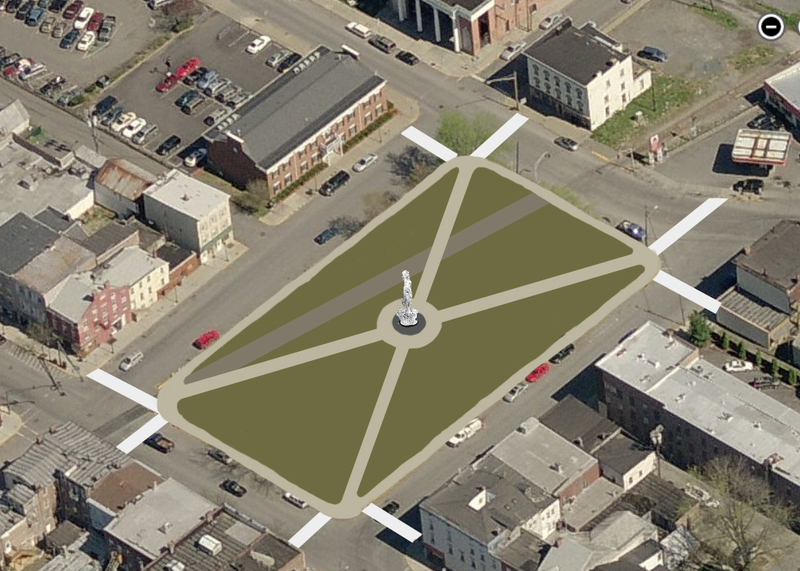 While I don't think the Hudson statue belongs in the traffic island, neither do I think it has to reside at the center of the park simply because it once did. In any event, I am curious: if Gossips' commenters were residents of Wolcott rather than Hudson, would they be willing to re-site the Wolcott Venus to a more dignified and less vulnerable place? Or would they insist it always remain where it is now simply because it was (presumably) placed there long ago? In a post on his blog on Monday, and to the consternation of many local residents, John Isaacs argued against a literal restoration of Hudson's Seventh Street Park. He suggested that the beloved Venus statue, which used to live at the park's center, be sited on an existing triangular traffic island at the nearby intersection of State, Greene, and Columbia Streets. I'm not sure he was entirely serious in making this suggestion, as the traffic island is meager, to be kind. But as I recently suggested a larger plaza at this very location, I thought I would take another look at this area as well as another possibility that has been on my mind for some time. You can click on the images for a closer look, but don't take my park design too literally as it calls for a more nuanced analysis than I can provide here. I'll try to take a closer look at it soon. I'd like an 11.4% refund, please. Last night, I counted thirteen missing channels between Channels 2 and 76. That means we're getting sixty-two of the seventy-plus channels we're paying for. EDIT, 12:40PM: Hmmm, I apparently ignored a notice from MHC that I was to request they send me a digital converter box. Given that I have a reasonably new television, I thought I didn't need one. So my bad. Then again, if MHC knows its customers need a converter box to use get full use of the service they are paying for, why doesn't MHC simply deliver them without our having to make an official request? How Buildings Learn: What Happens After They're Built by Stewart Brand. A completed building is really just a best guess by its designer as to what it needs to be. It is afterward, as a building is altered by its users, that it achieves its more significant reality. By the author of The Whole Earth Catalog. The Death and Life of Great American Cities by Jane Jacobs. Anyone interested in understanding how cities work in everyday life should start here. Written by a Greenwich Village mother who used tools no more sophisticated than her eye and ear, the book turned the urban planning establishment upside down when it appeared in 1961. Widely regarded as the twentieth century's most important book on urbanism, it has never been out of print. A Pattern Language: Towns, Buildings, Construction by Christopher Alexander et al. The authors explicate 253 "patterns" that can make our designed world work better, from the daylighting of rooms to the dimensions of porches to the arrangement of city blocks. City Comforts: How to Build an Urban Village by David Sucher. An unpretentious, extensively illustrated book with a kitchen sink of small ideas on improving urban places. Some of the ideas could have used an editor (the book is self-published), but it's nonetheless worth looking into, especially for novices and nonprofessionals. I've linked the titles above to Amazon so you can learn more about the books, but please buy them locally if at all possible. Does the HPC not recognize that the success and enjoyability of Warren Street today is a direct result of this very sort of alteration to countless other buildings on it? Its decision is tantamount to a declaration that Warren Street would be a better street if all the open storefronts were removed and replaced by double hung residential windows. Does the HPC realize how selective its view of history is? Very few, if any, people in 1790 or 1842 or 1911 would have objected to the owner of this or a similar building replacing two ground floor residential windows with a retail storefront. Such alteration was understood as an improvement to the building, street, and city: a local businessperson or family would get to make a living in the building and neighbors would get to shop locally for needed goods or services. So what gives, HPC? If you so revere our heritage, why do you honor only the physical artifacts of that heritage? Why do you not honor historical processes? Does the HPC grasp that anything it does to make retail more difficult in Hudson makes it incrementally more necessary for Hudson residents to traipse out to the Fairview Avenue strip for goods and services? Does it not recognize that anti-retail policies, far from safeguarding the urban condition, promote suburban sprawl? Historic preservationists did much in the past to save our urban centers. Sadly, they are now one of the primary obstacles to successful urbanism. None of this is to say the scheme wouldn't be viable today. I think I forgot about it because I usually don't like to interrupt through streets, particularly in urban districts where street identities are already compromised. But I think I find this scheme superior to the traffic circle scheme, in regard to traffic management as well as pedestrian environment. It's also likely it would require less extensive alterations to the surrounding infrastructure. Westbound thru-traffic, which used to follow a straight path from right to left in the photo, is now diverted around a small triangular island. Eastbound traffic, however, maintains its previous thru-route. What would happen if we also rerouted the eastbound traffic? We'd again end up with a simplified, seemingly more manageable four-way intersection. Additionally, the triangular island, which is currently too small to attract users or dignify the memorial now sited on it, could be extended southward to create a plaza that engages the existing buildings on that edge. Some planters, benches, and other improvements suggest a quite palatable urban space. With the (admittedly glib) replacement of the gas station on the west corner, the intersection might become a place to enjoy, rather than simply get through. Notice that the Hudson City Center (the large brick building at the top of the photo), which now seems alien to its site and to Hudson, looks much more anchored in space. And considered in context with the above suggested improvements at Columbia Turnpike and the proposed revamping of the Seventh Street Park a block to the west, one can imagine a rather pleasant progression down Columbia Street into the city grid, wending through a series of thoughtfully considered public spaces. My girlfriend found a lovely abandoned kitten while running on Mt. 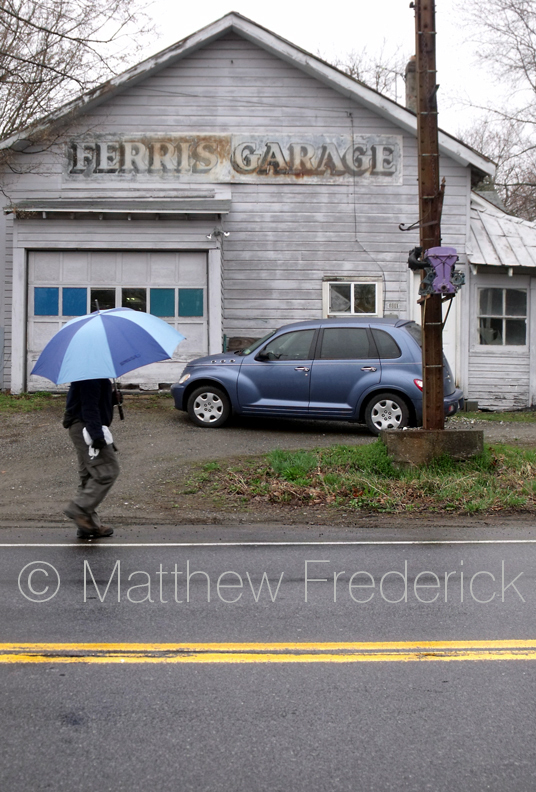 Merino Road in Greenport last week. It clearly had gone a long time without eating, and was quite terrified. We took her home, fed her copious amounts of food, and took her to Animalkind on Warren Street the next morning. 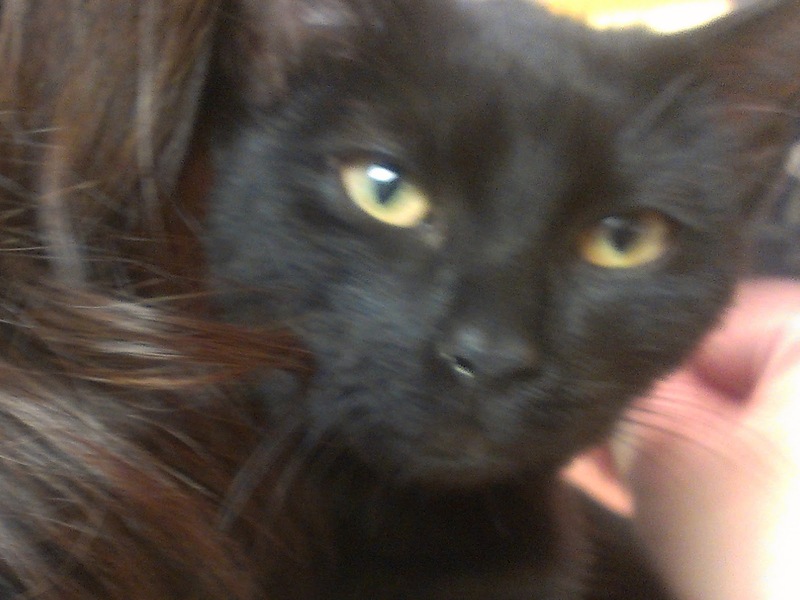 She was identified by microchip as "Betsy," and had been adopted from Animalkind not long before by a woman living on Front Street in Hudson. We wondered about the likelihood of a three-month old kitten wandering more than a mile through challenging terrain to an elevated Mt. Merino Road. Did her owner drive her there and abandon her? Our alarm increased when we learned the owner had taken in several other pets from Animalkind. I headed back to the area the next day. My heart sank when I found a dead calico at the foot of Mt. Merino Road on Route 9G. It had been struck by a car within the past day. Among the cats adopted by Betsy's former owner was a similar calico. Animalkind went to the site to verify the identity of the dead cat by microchip, but by the time they got there it had been scooped up and disposed of by the highway department. So far, efforts to verify the safety of the Front Street woman's other pets have been unsuccessful. The good news is that Betsy has been readopted into a stable new home, where she is enjoying her time with another recently found kitten.